1930's vintage dress shirt. 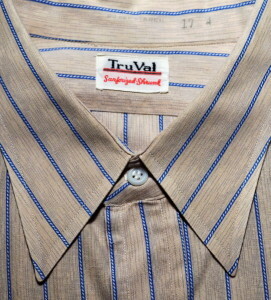 Tan with gray fleck print with blue rope motif stripe cotton broadcloth. Long point collar, with a slight curve at the outer edge. Single matched breast pocket. Long sleeves with button cuffs. Applied top stitched button placket. Original matching white plastic buttons. Shirt tails with side seam gussets. The art of fine shirt making seemed to go out of fashion during the war years. The fabrics used in making dress shirts from the turn-of-the-century through the 1930's were some of the most interesting print cottons ever used in mens fashion. This is one of those quintessential dress shirts. Shoulders, measured from seam to seam across back yoke - 20 1/2"
Sleeves, measured from seam to cuff edge - 25"
Center back length, measured from collar fold to hem edge - 33 1/2"
Overall EXCELLENT Condition. Very small, nearly imperceptible repairs at cuff placket & back shirt tail and minor faint pin dot marks at pocket seam. Simply a great 30's vintage shirt in top condition.